"These sour cream waffles are extra fluffy thanks to cake flour, which makes for fluffier waffles than AP flour. 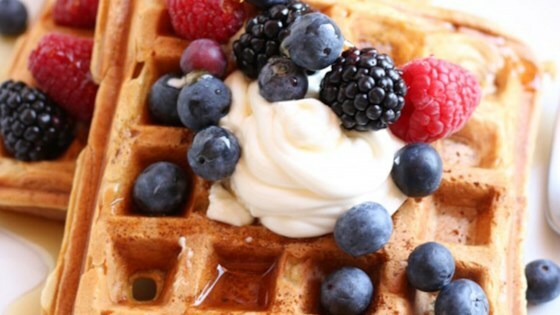 Serve topped with a dollop of sour cream, maple syrup, and fresh berries. Recipe created by Joanie Simon." I was searching online for recipes using sour cream since I had an overabundance. Both my husband & I enjoyed the waffles. The texture was just right. I would make them again. Extremely bland as this recipe didn't have any added salt. Once I added 1 tsp. of salt it was fine, nothing special. These waffles were good, they had a very nice texture, but i felt there were missing something. I added a half teaspoon of salt to the recipe and the flavor was much improved!